The full British Thoracic Society Guideline for Bronchiectasis in Adults is published in Thorax. The following is a summary of the recommendations and good practice points. The sections referred to in the summary refer to the full guideline. The appendices are available in the full guideline. 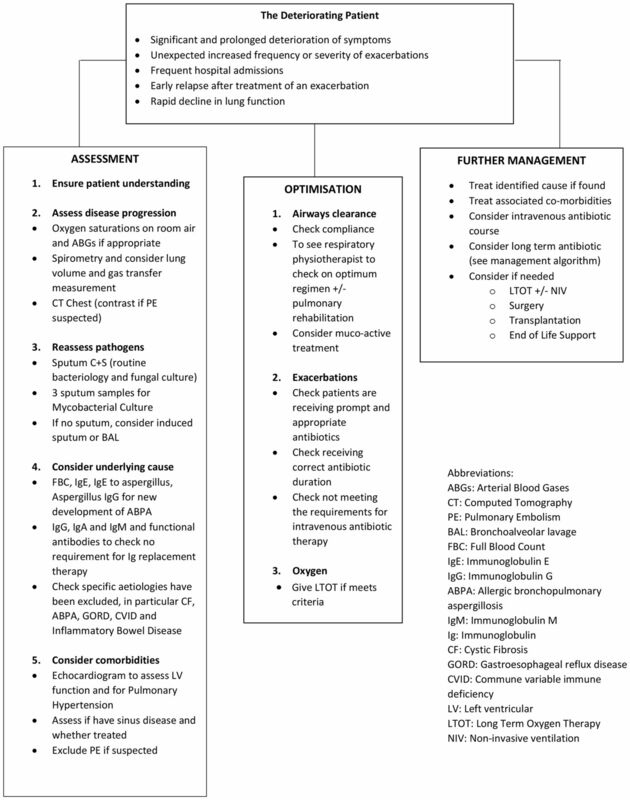 The full Guideline for Bronchiectasis in Adults is published in Thorax.1 The key features of the guideline are highlighted in a short article published to accompany the full guideline.2 The following is a summary of the recommendations and good practice points and includes all figures 1–5 and tables 1–7. The sections referred to in the summary refer to the full guideline. Management of the deteriorating patient. Antibiotics are used to treat exacerbations that present with an acute detrioration (usually over several days) with worsening local symptoms (cough,increased sputum volume or change of viscoisity, increased sputum purulence with or without increasing wheeze, breathlessness, haemoptypsis) and/ or systemic upset. The flow diagram refers to three or more annual exacerbations. Physiotherapy management - stepwise airway clearance. Algorithm for initial assessment and treatement - rhinosinusitis. Table 1 provides a summary of overall management. This guideline refers to the investigation and management of patients with symptoms of persistent or recurrent bronchial sepsis related to irreversibly damaged and dilated bronchi, namely clinical bronchiectasis. It does not cover the management of cystic fibrosis (CF), and for the purposes of the guideline, ‘bronchiectasis’ is synonymous with the term ‘non-CF bronchiectasis’. Likewise, it does not focus on traction bronchiectasis secondary to other lung pathologies, particularly the interstitial lung diseases, as the bronchiectasis is commonly asymptomatic. This guideline is aimed at all healthcare practitioners who are involved in the care of patients with bronchiectasis: this will include primary care clinicians (general practitioners, practice and district nurses) and hospital specialist teams in infectious disease, respiratory medicine (respiratory nurse specialists, respiratory physiotherapists, pharmacists, physicians and surgeons), microbiologists, and radiologists. This guideline covers adults. The following patient groups not covered by this guideline are patients with CF bronchiectasis and children up to and including 15 years of age. This guideline is based on the best available evidence. The methodology used to write the guideline adheres strictly to the criteria as set by the Appraisal of Guidelines, Research and Evaluation collaboration, which is available online (www.agreetrust.org/resource-centre/agree-ii/). The British Thoracic Society Standards of Care Committee guideline production manual is also available online (http://www.brit-thoracic.org.uk/guidelines-and-quality-standards/). Clinical questions were structured in the PICO (Patient, ﻿ Intervention, Control, Outcome) format (see full guideline, online appendix 11) to define the scope of the guideline and inform the literature search. Systematic electronic database searches were conducted in order to identify potentially relevant studies for inclusion in the guideline. For each topic area, the following databases were searched: Ovid MEDLINE (including MEDLINE In Process), Ovid EMBASE and the Cochrane Library (including the Cochrane Database of Systematic Reviews, the Database of Abstracts of Reviews of Effects) from 1980. The searches were first run in June 2014 and updated in June 2016 (see full guideline, appendix 2 for search strategy). Searches included a combination of indexed terms and free text terms and were limited to English language publications only. The initial search identified 3848 potentialabstracts and the second search 1021 abstracts. The available volume of the body of evidence. How applicable the obtained evidence was in making recommendations for the defined target audience of this guideline. Whether the evidence was generalisable to the target population for the guideline. Whether there was a clear consistency in the evidence obtained to support recommendations. What the implications of recommendations would be on clinical practice in terms of resources and skilled expertise. Cost-effectiveness was not reviewed in detail as in-depth economic analysis of recommendations falls beyond the scope of this guideline. Recommendations were graded from A to D as indicated by the strength of the evidence as shown in table 3. In line with SIGN guidance, ‘minus’ evidence was considered in context, but in the absence of other ‘plus’ supporting evidence, it was discussed among the Guideline Development Group (GDG) regarding that point and any recommendation hence made was grade D. Important practical points lacking any research evidence nor likely to be research evidence in the future were highlighted as ‘Good Practice Points’. The GDG corresponded regularly by email and meetings of the co-chairs subgroup and full group were held in January, May and June 2014; January, May, September and December 2015; January, April and December 2016; January and November 2017. A number of teleconferences were also held. The BTS Standards of Care Committee (SOCC) reviewed the draft guideline in November 2017. The draft guideline was made available online March–April 2018 for public consultation and circulated to all the relevant stakeholders. The BTS SOCC re-reviewed the revised draft guideline in June 2018 and final SOCC approval granted in July 2018. This BTS Guideline will be reviewed within 5 years from the publication date. All members of the Guideline Group made declarations of interest in line with BTS Policy and further details can be obtained on request from BTS. Guideline Group members are listed in online appendix 1 to the full guideline. Professor Michael Loebinger represented the Royal College of Physicians, London. Dr Kevin Gruffydd-Jones represented the Primary Care Respiratory Society UK. Ms Karen Payne represented the Association of Respiratory Nurse Specialists. Ms Lizzie Grillo represented the Association of Chartered Physiotherapists in Respiratory Care. How should the diagnosis of bronchiectasis be determined? Perform baseline chest X-ray in patients with suspected bronchiectasis (D). Perform a thin-section CT to confirm a diagnosis of bronchiectasis when clinically suspected (C). Perform baseline imaging during clinically stable disease as this is optimal for diagnostic and serial comparison purposes (D). The most appropriate imaging protocol will vary according to scanner technology and patient factors. When using volumetric CT, dose-reduction techniques including adaptive milliampere and kilovolt and iterative reconstruction should be used where available. Reconstruction algorithm: high spatial frequency. mAs (or effective mAs): 100–200. Gantry rotation time: <0.5 s.
Bronchoarterial ratio >1 (internal airway lumen vs adjacent pulmonary artery). Airway visibility within 1 cm of costal pleural surface or touching mediastinal pleura. Mosaic perfusion/air trapping on expiratory CT.
CT scanning can also aid in identifying an aetiology of bronchiectasis, for example Allergic broncho pulmonary aspergillosis (ABPA), Non tuberculous mycobacteria (NTM), primary ciliary dyskinesia, alpha one antitrypsin deficiency, Williams-Campbell syndrome and a foreign body. In whom should the diagnosis of bronchiectasis be suspected? Consider investigation for bronchiectasis in patients with persistent production of mucopurulent or purulent sputum particularly with relevant associated risk factors (D). Consider investigation for bronchiectasis in patients with rheumatoid arthritis if they have symptoms of chronic productive cough or recurrent chest infections (C). Consider investigation for bronchiectasis in patients with chronic obstructive pulmonary disease (COPD) with frequent exacerbations (two or more annually) and a previous positive sputum culture for Pseudomonas aeruginosa while stable (B). Consider investigation for bronchiectasis in patients with inflammatory bowel disease and chronic productive cough (C). In at-risk groups, if bronchiectasis is suspected, bronchiectasis needs confirmation. In patients with COPD, investigation for bronchiectasis may be appropriate especially in the presence of chronic productive cough with positive sputum cultures for potential pathogenic micro-organism (PPM) while stable or two or more exacerbations in the preceding 12 months. In patients with asthma, investigation for bronchiectasis may be appropriate with severe or poorly controlled disease. In patients with a history of HIV-1 infection, solid organ and bone marrow transplant, and history of immunosuppressive therapy for lymphoma and vasculitis, investigation for bronchiectasis may be appropriate with symptoms of chronic productive cough or recurrent chest infections. In patients with chronic rhinosinusitis, investigation for bronchiectasis may be appropriate with symptoms of chronic productive cough or recurrent chest infections. In patients with other connective tissue disease or inflammatory bowel disease, investigation for bronchiectasis may be appropriate if they have symptoms such as chronic productive cough or recurrent chest infections. Investigation for bronchiectasis may be appropriate in otherwise healthy individuals with a cough that persists for longer than 8 weeks, especially with sputum production or a history of an appropriate trigger (see BTS Recommendations for the management of cough in adults 4). Comorbidities and medical history should be recorded in patients diagnosed with bronchiectasis to identify relevant and possibly causative disease such as rheumatoid arthritis, COPD, asthma, gastro-oesophageal reflux disease and inflammatory bowel disease (C). Measure full blood count, serum total IgE and assessment of sensitisation (specific IgE or skin prick test) to Aspergillus fumigatus in all patients with bronchiectasis (D). Serum IgG, IgA and IgM should be performed in all patients with bronchiectasis (C). Consider measuring baseline specific antibody levels against capsular polysaccharides of Streptococcus pneumoniae in all patients to investigate for specific antibody deficiency. If pneumococcal antibodies are low, immunise with 23 valent polysaccharide pneumococcal vaccine, followed by measurement of specific antibody levels 4–8 weeks later (D). Test for cystic fibrosis (according to the National Institute for Health and Care Excellence (NICE) Guidelines for CF) in patients with supporting clinical features, for example early onset, male infertility, malabsorption and pancreatitis (B). Test for Primary Ciliary Dyskinesia (PCD) (according to ERS Guidelines for PCD Diagnosis) in patients with supporting clinical features, including a history of neonatal distress, symptoms from childhood, recurrent otitis media, rhinosinusitis or infertility (A). Sputum cultures should be performed in all patients with bronchiectasis for routine and mycobacterial culture (D). A previous diagnosis of idiopathic bronchiectasis should prompt careful reinvestigation for a primary cause in the context of a deteriorating clinical course or a young patient (us​ually considered to be age 50 and under but not limited to this age group). Referral to a specialist centre for investigation should be considered for young patients (usually considered to be age 50 and under but not limited to this age group) and those with apparent idiopathic bronchiectasis especially where there is evidence of progressive disease. Consider testing for rheumatoid factor (RF), anti-cyclic citrullinated peptide (CCP), anti-nuclear antibodies (ANA) and anti-neutrophil cytoplasmic antibodies (ANCA) in patients with coexisting clinical features of arthritis, connective tissue disease and/or systemic vasculitis. Consider testing for A1AT deficiency in patients with coexisting basal panacinar emphysema. Investigations for reflux and aspiration should be undertaken only in symptomatic patients or where there are other suggestive clinical features. Consider bronchoscopy for patients with localised disease to rule out an endobronchial lesion or foreign body as the cause of bronchiectasis. A bronchial aspiration or bronchial wash targeting the areas of bronchiectasis from CT scan of the chest should be considered in patients who do not expectorate and can be particularly helpful in the diagnosis of NTM pulmonary disease. Serum protein electrophoresis should be performed in all patients with bronchiectasis with raised immunoglobulins. Consider HIV-1 serology in patients with bronchiectasis depending on prevalence of HIV-1 and clinical features suggestive of increased risk of retroviral infection. Consensus criteria for diagnosis of ABPA need to be validated in bronchiectasis cohorts. Consensus criteria for definition of abnormal post-pneumococcal test immunisation antibody responses need to be validated in bronchiectasis cohorts. Consider using the Bronchiectasis Severity Index, which may help guide management (tables 4 and 5). Whichpatientsshould be taught airway clearance techniques? Teach individuals with bronchiectasis to perform airway clearance (D). Airway clearance techniques should be taught by a respiratory physiotherapist. At initial assessment, a respiratory physiotherapist should educate the patient about their condition and if appropriate give advice on adjuncts (inhaled/oral therapy or exercise) that may enhance effectiveness of their chosen airway clearance technique. Patients admitted with an exacerbation of​ bronchiectasis should be seen daily by a respiratory physiotherapist until their airway clearance is optimised. Which airway clearance techniques should be taught? Offer active cycle of breathing technique or oscillating positive expiratory pressure to individuals with bronchiectasis (D). Consider gravity-assisted positioning (where not contraindicated) to enhance the effectiveness of an airway clearance technique (D). CT imaging should be reviewed to complement the physiotherapy assessment. Where indicated, this information could be used in order to teach the patient the appropriate postural drainage position(s) for their affected bronchopulmonary segment(s). Patients should be made aware of the range of available airway clearance techniques. Consider patient preference and adherence when recommending an airway clearance technique. Consider the inclusion of the forced expiration technique (huff) for all airway clearance techniques. Consider modified postural drainage (no head down tilt) in patients for whom postural drainage is contraindicated or not tolerated. If symptoms of gastro-oesophageal reflux increase with modified postural drainage (no head down tilt), an airway clearance technique in the sitting position should be taught. Consider autogenic drainage, positive expiratory pressure, high-frequency chest wall oscillation and intrapulmonary percussive ventilation as an alternative airway clearance technique if other techniques are not effective or acceptable to the patient. Patients should be encouraged to perform regular physical exercise (plus the forced expiration technique/huff) to promote airway clearance. If there is ongoing haemoptysis, refer back to the respiratory physiotherapist to determine the optimum airway clearance technique. Manual techniques may be offered to enhance sputum clearance when the patient is fatigued or undergoing an exacerbation. Consider intermittent positive pressure breathing or non-invasive ventilation during an acute exacerbation to offload the work of breathing so fatigued and/or breathless patients can tolerate a longer treatment session and can adopt postural drainage positions. Randomised controlled trials using clinically important outcome measures are required to assess the effectiveness of airway clearance techniques in varying severities of bronchiectasis. Randomised controlled trials are required to evaluate the effects of airway clearance techniques in patients who are undergoing an exacerbation. How often should patients carry out airway clearance techniques? How long should an airway clearance session last? The frequency and duration of the airway clearance technique should be tailored to the individual and may alter during periods of exacerbation. Advise individuals to perform their airway clearance technique for a minimum of 10 min (up to a maximum of 30 minutes). After this time, they should continue until two clear huffs or coughs are completed, or until the patient is starting to become fatigued. How soon should the patient be reviewed after the initial assessment? Individuals whot have been assessed and taught an airway clearance technique should be reviewed by a respiratory physiotherapist within 3 months of their initial assessment. Individuals with bronchiectasis who are followed up in secondary care should be assessed by a respiratory physiotherapist as part of their annual clinical review to ensure their airway clearance regimen is optimised. All individuals with a deterioration in their condition (increased frequency of exacerbations and/or worsening of symptoms) should have their airway clearance technique reviewed by a respiratory physiotherapist (see figure 1–management of the deteriorating patient). Do not routinely use recombinant human DNase in adults with bronchiectasis (A). Consider the use of humidification with sterile water or normal saline to facilitate airway clearance (D). Consider a trial of mucoactive treatment in patients with bronchiectasis who have difficulty in sputum expectoration. Perform an airway reactivity challenge test when inhaled mucoactive treatment is first administered. Consider pretreatment with a bronchodilator prior to inhaled or nebulised mucoactive treatments especially in individuals where bronchoconstriction is likely (patients with asthma or bronchial hyper-reactivity and those with severe airflow obstruction FEV1 <1 litre). If carbocysteine is prescribed, a 6-month trial should be given and continued if there is ongoing clinical benefit. See figures 3 and 4. See Full Guideline appendix 2: Challenge test details. Randomised controlled trials are needed to assess the long-term impact of mucoactive therapies. What is the evidence for long-term anti-inflammatory therapies in bronchiectasis? Do not routinely offer inhaled corticosteroids to patients with bronchiectasis without other indications (such as ABPA, chronic asthma, COPD and inflammatory bowel disease) (B). Do not offer long-term oral corticosteroids for patients with bronchiectasis without other indications (such as ABPA, chronic asthma, COPD, inflammatory bowel disease) (D). Do not routinely offer PDE4 inhibitors, methylxanthines or leukotriene receptor antagonists for bronchiectasis treatment (D). Do not routinely offer CXCR2 antagonists, neutrophil elastase inhibitors or statins for bronchiectasis treatment (B). Inhaled corticosteroids have an established role in the management of asthma and a proportion of patients with COPD, which are common comorbid conditions in bronchiectasis. Randomised controlled trials are needed to assess the long-term impact of anti-inflammatory therapies. What treatments improve outcomes for patients with stable bronchiectasis? Prior to starting long-term macrolides, for safety reasons, (1) ensure no active NTM infection with at least one negative respiratory NTM culture; (2) use with caution if patient has significant hearing loss needing hearing aid(s) or significant balance issues. Prior to starting long-term inhaled aminoglycosides, for safety reasons, (1) avoid using if creatinine clearance <30 mL/min, (2) use with caution if patient has significant hearing loss needing hearing aid(s) or significant balance issues; (3) avoid concomitant nephrotoxic medications. Counsel patients about potential major side effects with long-term antibiotics and to seek urgent attention if these develop. Review the patient’s culture and mycobacterial status, optimise airway clearance and treat other associated conditions before starting long-term antibiotics. Prophylactic antibiotics should be only started by respiratory specialists. Review patients on long-term antibiotics 6 monthly with assessment of efficacy, toxicity and continuing need. Monitor sputum culture and sensitivity regularly, although in vitro resistance may not affect clinical efficacy. As adverse event frequency of azithromycin is likely to be dose related, 250 mg 3 times a week is a pragmatic starting dose which can then be increased according to clinical response and adverse events. Thresholds for long-term treatment may reduce if the patient is symptomatic between exacerbations and/or the exacerbations respond poorly to treatment and/or the patient is at high risk of severe exacerbation, for example, immunosuppressed. Long-term antibiotic choice is complex and has to take into account factors such as tolerance, allergies and sensitivity; therefore, in some circumstances, other long-term antibiotic regimens may be appropriate (see full guideline appendix 3). Perform a suitable challenge test when stable before starting inhaled antibiotics (see full guideline appendix 2). Consider cyclical intravenous antibiotics in patients with repeated infections (≥5/year) despite other treatments. Alternative inhaled/nebulised agents may become licensed as international studies are completed. For patients receiving long-term prophylactic oral antibiotics, the preferred option is to remain on the same antibiotic as opposed to monthly rotation of antibiotics. If there is a subsequent lack of efficacy, the antibiotic can be changed guided by sensitivity results. Long-term randomised controlled trials of oral and inhaled antibiotics are needed to assess their efficacy and safety in patients with bronchiectasis who have frequent respiratory tract infections with recurrent P. aeruginosa infection or other potential pathogenic micro-organisms. Does long-term bronchodilator treatment improve outcomes for patients with bronchiectasis? Use of bronchodilators in patients with bronchiectasis and coexisting COPD or asthma should follow the guideline recommendations for COPD or asthma (D). Offer a trial of long-acting bronchodilator therapy in patients with symptoms of significant breathlessness (D). 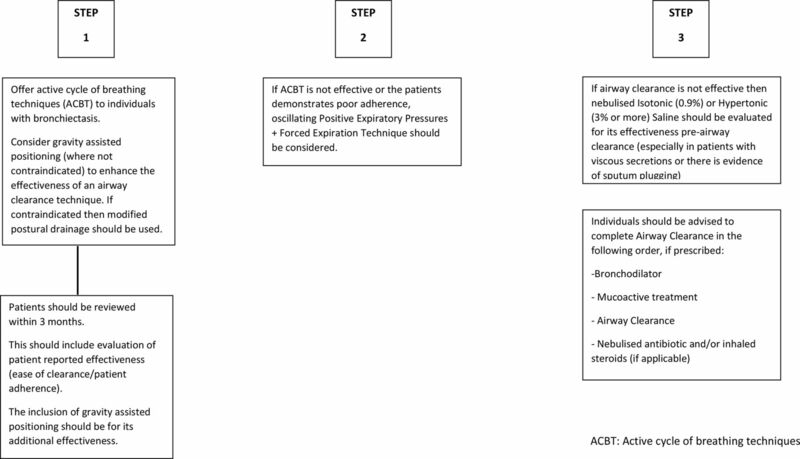 Reversibility testing to beta-2 agonist or anticholinergic bronchodilators may help to identify patients with coexisting asthma, but there is no evidence to suggest that a response is required in order to benefit from bronchodilators (D). Offer pulmonary rehabilitation to individuals who are functionally limited by shortness of breath (Modified Medical Research Council Dyspnoea Scale ≥1) (B). Consider the use of inspiratory muscle training in conjunction with conventional pulmonary rehabilitation to enhance the maintenance of the training effect (B). Educate all individuals with bronchiectasis on the importance of an exercise training programme. Consider the 6 minute walk test (6MWT) and/or the incremental shuttle walking test (ISWT) when evaluating exercise capacity before/after pulmonary rehabilitation in bronchiectasis. Prior to this, practice tests should be carried out to eliminate any learning effect. Pulmonary rehabilitation providers should offer education sessions tailored to the needs of individuals with bronchiectasis (eg, airway clearance techniques, the pathophysiology of bronchiectasis and relevant inhaled therapy). Pulmonary rehabilitation exercise and education sessions should be provided by appropriately qualified healthcare practitioners. Further information on pulmonary rehabilitation is provided in the BTS Quality Standards for Pulmonary rehabilitation (https://www.brit-thoracic.org.uk/standards-of-care/quality-standards/bts-pulmonary-rehabilitation-quality-standards/). The role of education, self-management plans and who delivers the pulmonary rehabilitation needs to be explored. The role of pulmonary rehabilitation after exacerbations requiring hospital admission needs to be explored. The incidence of cross-infection of respiratory pathogens in the group exercise setting should be investigated in the bronchiectasis population. What is the role of surgery in managing bronchiectasis? Consider lung resection in patients with localised disease whose symptoms are not controlled by medical treatment optimised by a bronchiectasis specialist (D). Offer multidisciplinary assessment, including a bronchiectasis physician, a thoracic surgeon and an experienced anaesthetist, of suitability for surgery and preoperative assessment of cardiopulmonary reserve post resection (D). Consider nutritional support and preoperative pulmonary rehabilitation before surgical referral. Consider transplant referral in bronchiectasis patients aged 65 years or less if the FEV1 is <30% with significant clinical instability or if there is a rapid progressive respiratory deterioration despite optimal medical management (D). Consider earlier transplant referral in patients with bronchiectasis with poor lung function and the following additional factors: massive haemoptysis, severe secondary pulmonary hypertension, intensive care unit admissions or respiratory failure (particularly if requiring non invasive ventilation (NIV)) (D). Discuss appropriate patients with a transplant centre prior to formal referral. Optimise management of comorbidities such as osteoporosis and maintaining physical condition through pulmonary rehabilitation prior to transplant. What is the role of influenza and pneumococcal vaccination in management of bronchiectasis? Offer annual influenza immunisation to all patients with bronchiectasis (D). Offer polysaccharide pneumococcal vaccination to all patients with bronchiectasis (D). Consider influenza vaccination in household contacts of patients with immune deficiency and bronchiectasis to reduce the risks of secondary transmission. Consider use of 13 valent protein conjugate pneumococcal vaccine in patients with bronchiectasis who do not have an appropriate serological response to standard polysaccharide vaccine (23 valent carbohydrate pneumococcal vaccine). Consider long-term oxygen therapy for patients with bronchiectasis and respiratory failure, using the same eligibility criteria as for COPD (D). Consider domiciliary non-invasive ventilation for patients with bronchiectasis and respiratory failure associated with hypercapnia, especially where this is associated with symptoms or recurrent hospitalisation (D). Do not routinely recommend alternative treatments (for example cough suppression, nutritional supplementation, complementary therapy/homeopathy, supplemental treatments) as part of the management of patients with bronchiectasis (D). Record patient’s weight and Body Mass Index at each clinic appointment. Further interventional/randomised controlled trials are needed to establish the role of any alternative therapies in the management of bronchiectasis. Studies assessing the benefits of nutritional supplementation in patients with bronchiectasis should be undertaken. Do pathogens have an impact on prognosis in bronchiectasis? Consider patients with chronic P. aeruginosa colonisation at higher risk of bronchiectasis-related complications (B). Perform regular sputum microbiology screening for patients with clinically significant bronchiectasis to monitor for pathogens and detect new isolation of P. aeruginosa (C). What is the evidence of for the role of viruses/fungal diseases in patients with bronchiectasis? Testing to detect viral infection should be considered in patients with an exacerbation of bronchiectasis. Do not routinely use antifungal therapy without evidence of fungal disease. Fungal cultures can be positive in those receiving long-term antibiotic therapy. Does eradication of potentially pathogenic micro-organisms improve outcomes in patients with stable bronchiectasis? Offer patients with bronchiectasis associated with clinical deterioration and a new growth of P. aeruginosa (first isolation or regrowth in the context of intermittently positive cultures) eradication antibiotic treatment (first-line treatment: ciprofloxacin 500–750 mg twice per day for 2 weeks; second-line treatment: intravenous anti-pseudomonal beta-lactam ± an intravenous aminoglycoside for 2 weeks, followed by a 3-month course of nebulised colistin, gentamicin or tobramycin) (D). Discuss with patients the potential risks and benefits of starting eradication antibiotic treatment versus clinical observation following a new growth of P. aeruginosa in the context of stable bronchiectasis. This will include consideration of the likelihood of achieving sustained eradication, the risk of developing chronic infection and the risk of adverse events with each management approach (D). Offer patients with bronchiectasis associated with clinical deterioration and a new growth of methicillin-resistant Staphylococcus aureus (first isolation or regrowth in the context of intermittently positive cultures) eradication. This should be attempted especially in view of infection control issues (D). Send sputum for culture and sensitivity immediately before and at each clinical attendance following antibiotics prescribed for bacterial eradication to determine the outcome of treatment. A randomised control trial of P. aeruginosa eradication therapy is needed to determine the microbiological and clinical outcomes of eradication therapy. Does antibiotic therapy improve outcomes in patients with an exacerbation of bronchiectasis? A patient self-management plan should be considered; an example is provided online (https://www.brit-thoracic.org.uk/standards-of-care/quality-standards/bts-bronchiectasis-quality-standards/) (see table 6). There should be prompt treatment of exacerbations and suitable patients should have antibiotics to keep at home. Previous sputum bacteriology results can be useful in deciding which antibiotic to use. Table 6 highlights the ﬁrst-line and alternative treatments for the common bacterial pathogens implicated in exacerbations of bronchiectasis. Where possible, sputum (spontaneous or induced) should be obtained for culture and sensitivity testing prior to commencing antibiotics. Empirical antibiotics can then be started while awaiting sputum microbiology. Once a pathogen is isolated, antibiotics can be modified if there is no clinical improvement, with treatment guided by antibiotic sensitivity results. In general, antibiotic courses for 14 days are standard and should always be used in patients infected with P. aeruginosa. Shorter courses may suffice in patients with mild bronchiectasis. Intravenous antibiotics should be considered when patients are particularly unwell, have resistant organisms or have failed to respond to oral therapy (this is most likely to apply to patients with P. aeruginosa). What treatments improve outcomes in patients with bronchiectasis and allergic bronchopulmonary aspergillosis? Does immunoglobulin replacement treatment therapy improve outcomes in patients with bronchiectasis due to antibody deficiency? Consider IgG therapy for patients with specific polysaccharide antibody deficiency and/or IgA deficiency or IgG subclass deficiencies with absent/impaired pneumococcal vaccine antibody responses who continue to have objective evidence of bacterial sinopulmonary infection and progressive disease despite appropriate management of bronchiectasis (C). Offer patients receiving replacement IgG the choice of hospital or home-based therapy. Randomised controlled trials are needed to assess which patients with bronchiectasis would benefit from long-term immunoglobulin G replacement therapy alone or as an adjunct to long-term antibiotic therapy—assessing the optimal dose of IgG replacement and identification of ideal trough IgG level to prevent recurrent infections. GORD should be considered in patients with hiatus hernia, persistent coliforms in sputum samples or recurrent exacerbations with no other cause identified. Investigate patients who may have gastro-oesophageal reflux according to local policies. Consider the addition of prokinetic agents if symptoms of GORD increase with an airway clearance technique in sitting position. Avoid eating in the hour immediately prior to physiotherapy. What is the prevalence of rhinosinusitis in patients with stable bronchiectasis and what are the outcomes of treatment? 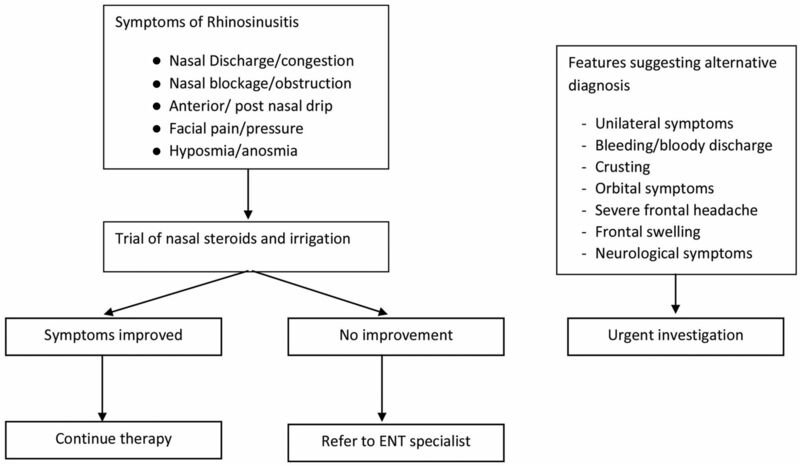 Patients with bronchiectasis and symptoms of rhinosinusitis should be evaluated and treated according to existing evidence-based treatment pathways (D). Should treatment of bronchiectasis be altered in the presence of comorbidities? Ensure optimal control of asthma and allergies in patients with both bronchiectasis and asthma (Grade D). Monitor patients with comorbid COPD and bronchiectasis as they are at higher risk of death (D). Patients with bronchiectasis and autoimmune conditions should be carefully assessed for autoimmune-related lung disease and often require long-term follow-up in a secondary care setting (D). Patients with bronchiectasis who require disease modifying antirheumatic drugs (DMARDs) or biologics for rheumatoid arthritis should be referred to a chest physician for further assessment before treatment is started (D). How should we monitor bronchiectasis? All patients with bronchiectasis should undergo routine monitoring in order to identify disease progression, pathogen emergence and modify treatment where necessary (D). Tailor the frequency of routine monitoring to the patient’s disease severity (see table 7). Assess patients annually and more frequently in more severe disease. Perform pulse oximetry to screen for patients who may need blood gas analysis to detect respiratory failure. A baseline CXR may provide a useful comparator in the event of clinical deterioration. Is there a role for microbiological sensitivity testing? Antibiotic sensitivity testing can be used to determine if resistance develops to either acute or long-term antibiotic treatment. Where possible, treatment should be guided by antibiotic sensitivity results but is often empirical based on previous sputum bacteriology. Some patients with an infective exacerbation may respond to antibiotic treatment despite resistance to that drug in vitro. Antibiotics should only be changed if there is no clinical response. For those on long-term antibiotic treatment, there should be repeat sensitivity testing where there is a clinical concern regarding loss of efficacy with therapy. Is there any evidence of cross-infection with pathogenic organisms (conventional bacteria and environmental mycobacteria)? Good cross-infection prevention principles should be applied: seek advice on local policies. The transmissibility of P. aeruginosa in CF appears more common. In the case of shared facilities with patients with CF, the cross-infection guidelines for CF should prevail. Large-scale robust data that confirm or refute the transmissibility of key pathogens such as P. aeruginosa and non-tuberculous mycobacteria are needed. Larger multicentre studies with longitudinal assessment of transmissible strains in bronchiectasis are needed. Studies are needed for P. aeruginosa and non-tuberculous mycobacteria as these are associated with poorer outcomes. Specialist clinics should be considered in patients requiring hospital follow-up. If haemoptysis 10 ml or less over a 24-hour period, treat with an appropriate oral antibiotic. If clinical deterioration, arrange emergency admission to hospital. Management of major haemoptysis should be multidisciplinary with involvement of respiratory physicians, interventional radiology and thoracic surgeons. Empirically treat patients with intravenous antibiotic therapy, based on their known microbiology, and consider adjunct treatment with tranexamic acid. Bronchial artery embolisation is the recommended first-line treatment if significant haemoptysis persists. Healthcare providers need to use clinical judgement, knowledge and expertise when deciding whether it is appropriate to apply recommendations for the management of patients. The recommendations presented here are a guide and may not be appropriate for use in all situations. The guidance provided does not override the responsibility of healthcare professionals to make decisions appropriate to the circumstances of each patient, in consultation with the patient and/or their guardian or carer.
. BTS Guideline for bronchiectasis in adults. Thorax 2019;74(Suppl 1).
. Updated BTS Adult Bronchiectasis Guideline 2018: a multidisciplinary approach to comprehensive care. Thorax 2019;74.
. BTS Guideline on the management of non-tuberculous mycobacterial pulmonary disease. Thorax 2017;72 (Suppl 2).
. Recommendations for the management of cough in adults. Thorax 2006;61(suppl_1):i1–i24. Contributors AH, AS and ML chaired the guideline group, and as lead author led the drafting and revision of the document. All authors drafted sections of the full guideline and undertook revisions of the paper. AH, AS and ML had final responsibility for the guideline and for the summary paper submitted to BMJORR. Competing interests All authors have completed a declaration of interest form in line with BTS Policy and copies are available from BTS head office on request. JC has declared funding from Bayer Healthcare, Griffols, Pfizer, Insmed, Chiesi, Boehringer Ingelheim, GlaxoSmithkline, Astra Zeneca, Napp. ADS has declared funding from Bayer Healthcare, Pfizer, Insmed, Boehringer Ingelheim, Astra Zeneca. SE has declared funding from GlaxoSmithKline. AF has declared funding from GlaxoSmithKline, Zambon, Insmed, Verona. KGJ has declared funding from Boehringer Ingelheim, GlaxoSmithkline, Astra Zeneca, Napp, TEVA, Chiesi, Nutricia, Novartis. CSH has declared funding from Aradigm, Gilead, Griffols, Insmed, Chiesi, GlaxoSmithkline, TEVA, Vertex, Zambon, Novartis. ATH has declared funding from Bayer Healthcare, Boehringer Ingelheim. JRH has declared funding from Pfizer. MRL has declared funding from Bayer Healthcare, Insmed, Pulmocide, Griffols, Polyphor, Savara. MT has declared funding from Novartis, Basilea, Stragen. RW has declared funding from Bayer Healthcare.